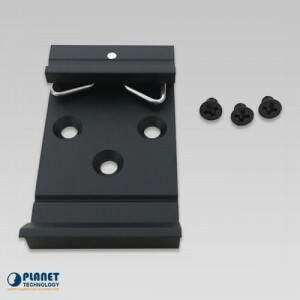 The IGTP-805AT from Planet Technology features a fiber optic link capability that allows for the extension of the network range. Note: ALL Industrial units do NOT include a power supply. 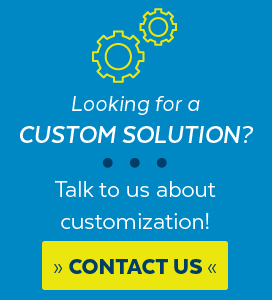 Click here to shop all Industrial Power Supply. 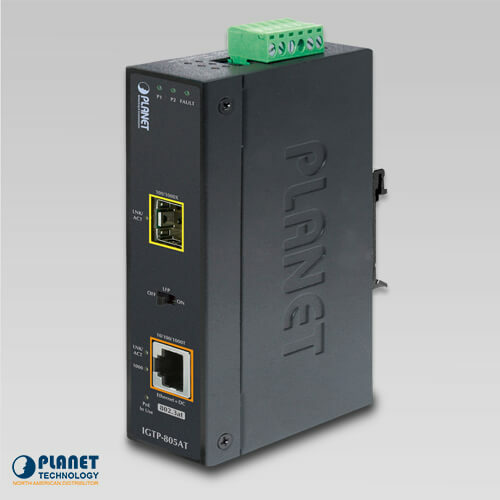 PLANET’s IGTP-805AT is an Industrial Gigabit Media Converter that combines Ethernet media conversion (from 1000BASE-X to 10/100/1000BASE-T) with 802.3at Power over Ethernet Plus (PoE+) injector. It delivers both up to 30 watts of power output and high data transmission speed to PDs (powered devices) installed in remote areas where sufficient and reliable power input is required. 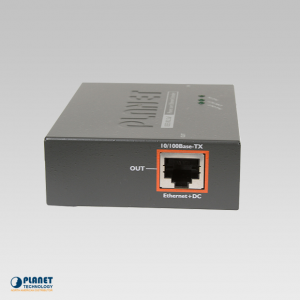 Its 1000BASE-X fiber optic uplink port provides long distance, high speed and stable data transmission to a remote core network. The power system of the IGTP-805AT supports 12~48V DC power input or 24V AC power input for power redundancy and operational flexibility. Operating under the temperature range of -40 to 75°C and being enclosed in an IP30 rugged case, the IGTP-805AT can be placed in almost any difficult environment. 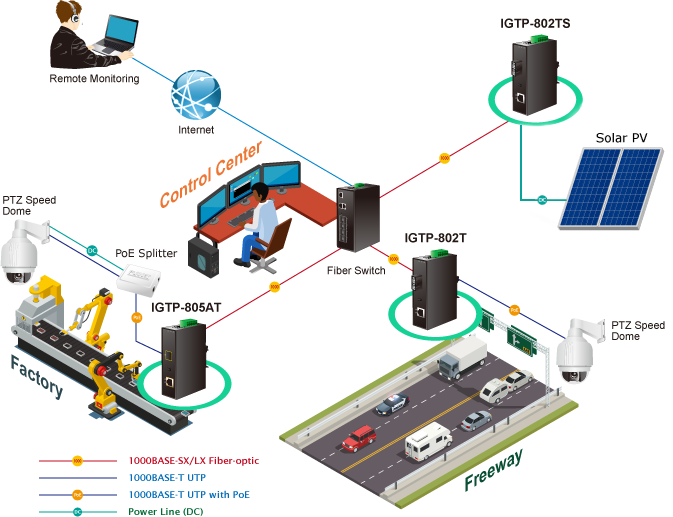 With the long fiber distance support, the IGTP-805AT still sustains the transmission performance as high as 1000Mbps. 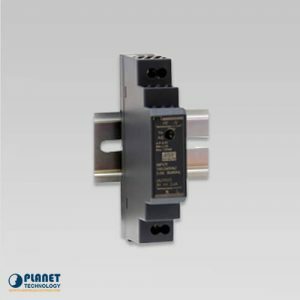 It works in the high-performance Store and Forward mechanism, and also can prevent packet loss with IEEE 802.3x flow control and the LFP (Link Fault Passthrough) function in the DIP switch design. 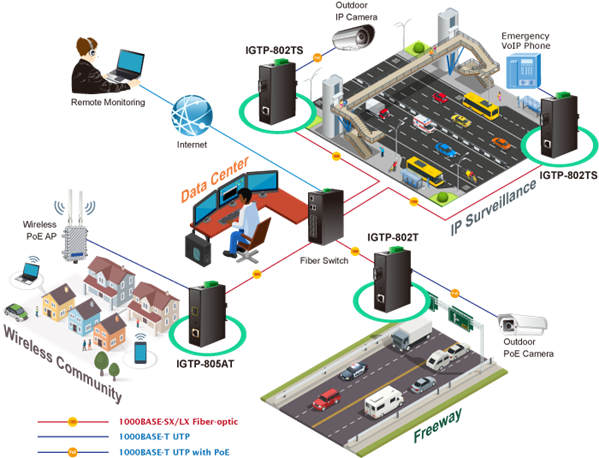 Furthermore, it can immediately alarm the administrators the issue from the link media and provide efficient solution to monitor the network power usage. 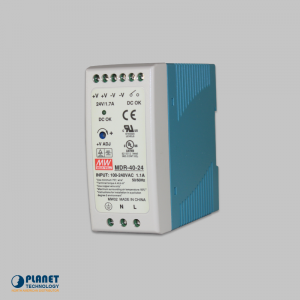 Complying with the IEEE 802.3at Power over Ethernet Plus technology, the IGTP-805AT provides up to 30 watts of PoE output power. 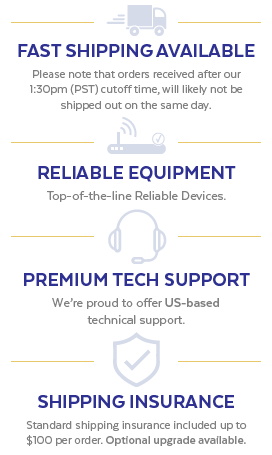 It is also backward compatible with 802.3af PoE standards to allow users to flexibly deploy standard and high powered devices simultaneously with no need of software configuration. With data and PoE from one unit, the IGTP-805AT can reduce cable deployment and eliminate the need for dedicated electrical outlets on the wall, ceiling or any unreachable place. 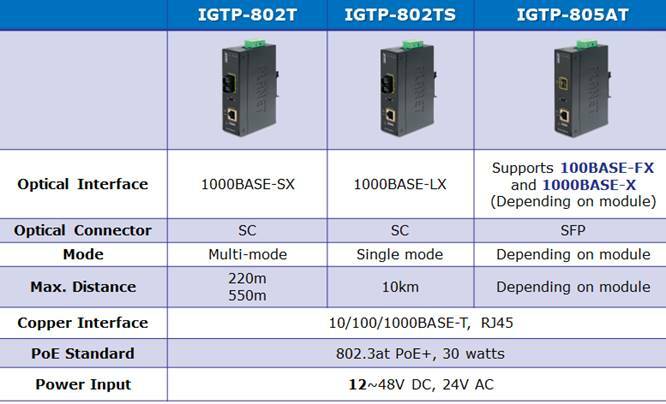 To facilitate the 802.3at power PoE+ usage with the commonly-used 12~48V DC power input or 24V AC power input for transportation and industrial-level applications, the IGTP-805AT adopts the 12~48V DC to 52V power boost technology to solve power source issue but does not require special power supplies. 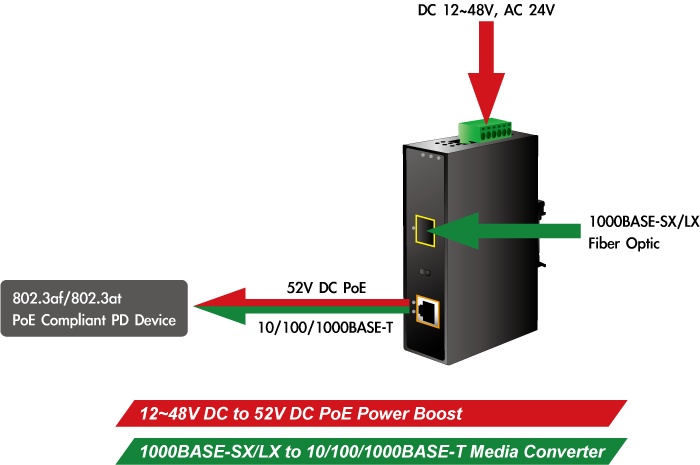 Its wide-ranging voltages design is suitable for worldwide operability with high availability applications requiring dual or backup power inputs. The IGTP-805AT is specifically designed with durable components and strong housing case to operate reliably in electrically harsh and climatically demanding environments like plant floors or curbside traffic control cabinets. The IGTP-805AT is packaged in a compact, IP30 rugged case that allows either DIN-rail or wall mounting to have the efficient use of cabinet space. With IP30 rugged case protection and PoE design, the IGTP-805AT is ideal for service providers, campuses and public areas to deploy PoE wireless access points, IP cameras or IP phones in any places easily and efficiently with cost-effectiveness. 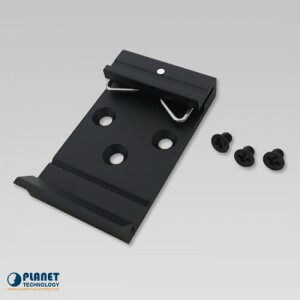 It can also operate in wide temperatures ranging from -40 to 75°C, which allows it to be placed in almost any location. 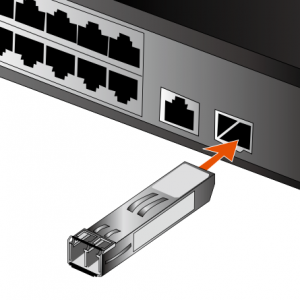 Copper 10/100/1000BASE-T Ethernet TP interface. Maximum 100m distance. 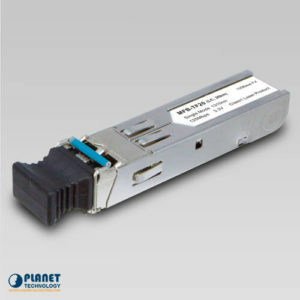 The MGB-TSX by Planet Technology is an extended temperature 1000Mbps Gigabit SFP Fiber Transceivers (-40 to 75 C). 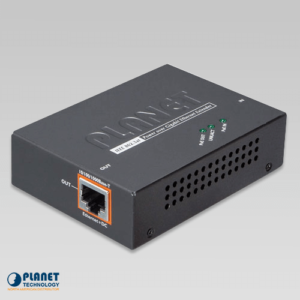 The POE-E201 from Planetechusa.com is an innovative solution to lengthen the reach of ethernet above the standard 100 meters. This device features IEEE 802.3at / 802.3af PoE standard. 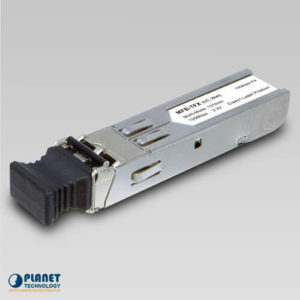 The MFB-TF20 by Planet Technology is an extended temperature 100Mbps Fast Ethernet SFP Fiber Transceiver (-40 to 75C). 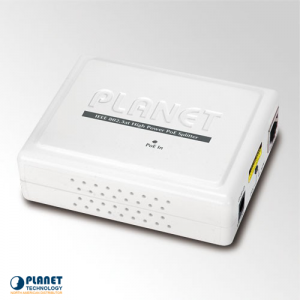 The POE-162S by Planet Technology is a quality PoE splitter that features the IEEE 802.3at High Power over Ethernet standard that features 24 watts of output power. 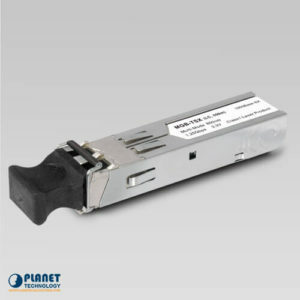 The MFB-TFX by Planet Technology is an extended temperature 100Mbps Fast Ethernet SFP Fiber Transceiver (-40 to 75C). The MGB-TLX by Planet Technology is an extended temperature 1000Mbps Gigabit SFP Fiber Transceivers (-40 to 75 C).